Since 1998 Indo Board has been used by the top pro surfers and surf fitness trainers in the world and is the leading surf-specific fitness training tool on the market. Whether you enjoy groomed runs, backcountry, half-pipe, or the terrain park; the Indo Board will improve your snowboarding or skiing. Snowboarders and skiers agree that Indo Board is the “original” balance board. Core strength, balance and agility are the pillars of being a top flight martial artist. 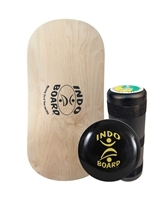 It is easy to see why the top UFC, MMA, BJJ, athletes choose Indo Board as a training tool. Whether you play baseball, soccer, football, basketball, lacrosse or any other team sport, using the Indo Board ensures that your balance, agility and core strength are on point. Running, cycling, triathlon are hard on the body. Using the Indo Board is a fun, low impact way of improving core strength, lower body joint stability and balance for all endurance athletes. Motorsports are some of the most physically demanding and core intensive sports in the world. It’s no mystery why more motorsports athletes choose the Indo Board for their core strength and balance training. Coordination, agility and balance are three of the most important components of fitness. For 20 years Indo Board has proven to be one of the best tool for training these components. SUP racing, SUP surfing and SUP Yoga all require a mastery of balance and stability. The Indo Board is the #1 trainer in the world for the top SUP athletes and their trainers. Wakesports demand incredible balance and total body strength. Indo Board is the #1 training tool for providing the fun and functionality that wakeboarders, wakeskaters, wakesurfers and waterskiers require. Since 1998, core skaters have known the Indo Board is the best way for skaters to have fun, improve their balance and practice their tricks when they are stuck indoors.